Nothing screams Halloween more than a classic carved Jack O' Lantern. Our new twists on the traditional Jack O' Lanterns make this old favorite seem new and fresh again. A display featuring over 100 Jack O Lanterns, carved for the Standard Hotel, NYC. Our carvers can work on site (or in our workshop) to create an incredible display of classic Jack O' Lanterns for your event. We also offer Jack O' Lantern classes, workshops, and carving parties, so you and your group can get hands on pumpkin carving tips from a pro. Contact us for info! 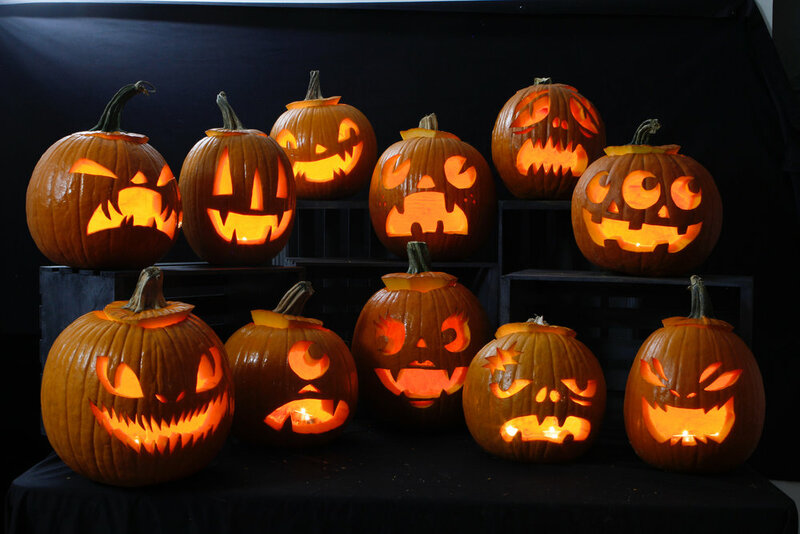 If you need one Jack O' Lantern or one hundred, our carvers can provide you with pumpkins that are sure to impress and add a fun classic Halloween vibe to any location. We love classic designs of the past are always inspired by the iconic jack o lantern postcard illustrations from the early 1900s. Carving Jack O' Lanterns dates back to the old Celtic holiday, Samhain. For this precursor to Halloween, people would often carve scary looking turnips, lighting them up with candles, in order to ward off spirits. When the Irish came to America, they found that pumpkins being grown here were an even better medium to carve. They adapted the custom to utilize the beautiful pumpkins that were now available to them. Long before social media, DMs, or text messages, people would send each other hand written messages on the backs of wonderfully illustrated postcards and many of these were in celebration of Halloween. These beautiful postcards dating back from the late 1800s through early 1900s, give us a glimpse into the past traditions of Halloween. Some of these original postcards still exist and are now highly sought after collectibles!